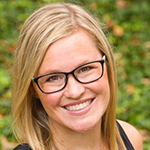 Thank you so much for visiting us at One Project Closer for this tutorial on How to Select Exterior Paint Colors for a Home! We hope you stick around and check out some of our other great tutorials and projects for the whole family. When we moved into our home 5 years ago, the red siding and orange brick didn’t seem too bad. Our daughter, who was three at the time, walked up to the house and holding my hand, looked up and said “Are you going to buy me a red and orange castle?” This, of course, was her dream come true since those were her favorite colors. My heart melted. And honestly, I figured we would change the color sooner than later. But there always seems to be big projects or big expenses that seem more pressing than a purely cosmetic house project. But you know how sometimes projects take on a life of their own? 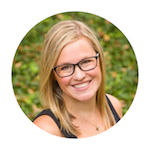 We recently decided we wanted to get a new front door – ours was pretty old and we wanted to also do away with the very old and annoying storm door. From there, we talked about new shutters and well, we might as well paint the whole house. YAYYYYYYY!!! We also decided on a new roof and getting rid of the weird coppola on top of the house. At first, I first drove myself a little crazy trying to find the perfect house color that would be sooooo trendy and everyone would love. Some people say “light gray,” some people say “dark gray.” But once I started picking colors, I realized I didn’t love all of everyone else’s favorites. And then I chatted with my friend Jacque at The DIY Village who repeatedly reminded me to go with my own gut and not worry about what other people think. When picking a color, especially grays, the undertone of the color is going to make a BIG difference. So I really needed to think about whether I wanted a cool gray or a warm gray. 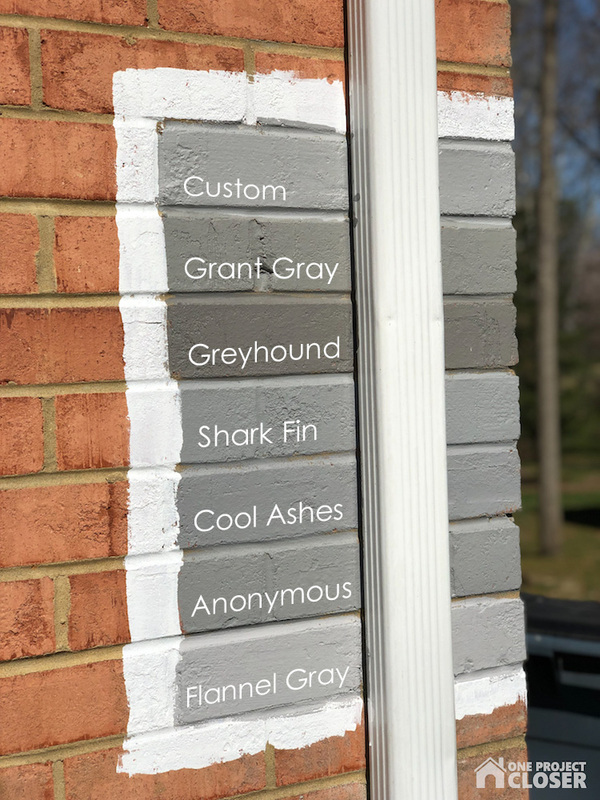 I picked a few of my favorite colors at Home Depot, got samples (you know those $3 little paint containers), and painted them on different sides of the house and on both the brick and siding. This is super important so you can see how the sun looks on each color at different times of day and with different degrees of sunshine. With the red siding, I had a really hard time seeing the true colors and undertones, so I painted a white box around them, and it was super helpful! Now check it out in a different light and see how different all the colors look??? 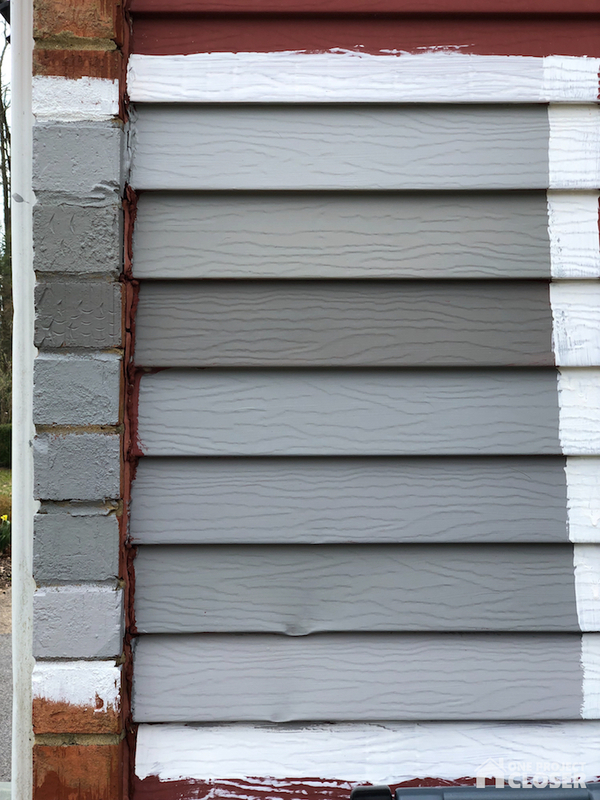 In our case, we are painting both the brick and siding, so complimenting those features made no impact on our color choice. But, if you are painting and have brick or siding to compliment, stick with colors with the same undertones. For example, if you have red brick (warm), pick a warm color with red or yellow undertones. If you have stone (cool), pick a cool color with blue or purple undertones. This is going to be your new best friend! 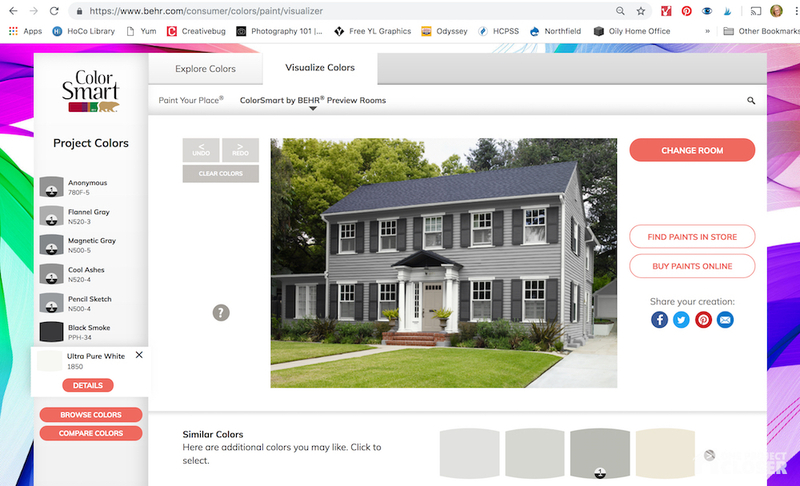 Behr has a Paint Previewer online and you can try out different colors on siding, trim, doors, and shutters. It’s amazing! I was able to put all my favorites on a house similar to the style of ours. This doesn’t replace buying actual samples and seeing them in action on your home. Nothing can replace seeing it in person and in different lights. 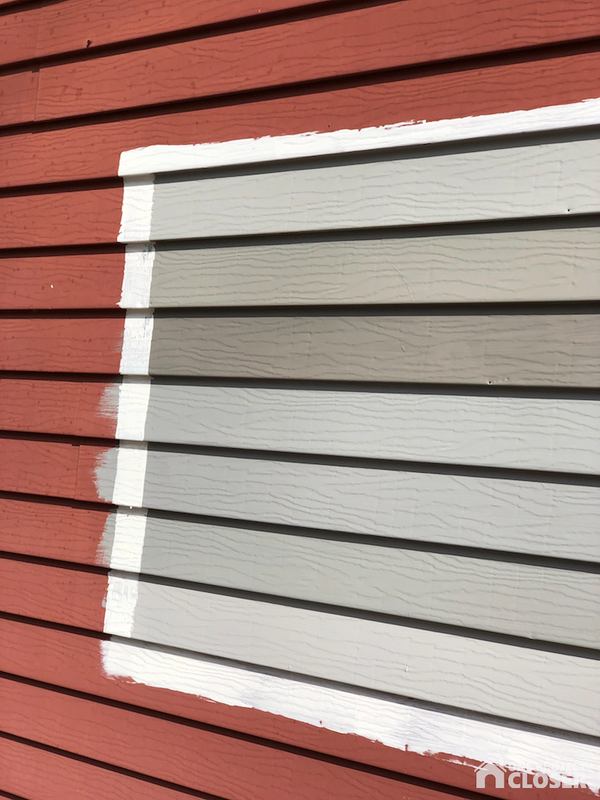 But this online feature is really great for seeing how colors look together on trim, shutter and siding.